This was my second Calstar star party. 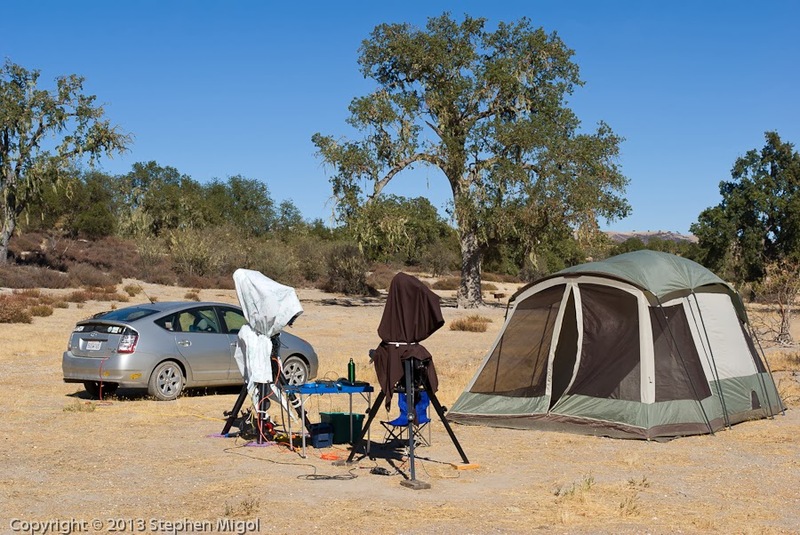 For reference, it is the end-of-season star party held at Lake San Antonio, near Lockwood CA. The skies are dark and there is little light pollution. Getting there is not so hard, it's mostly 101 south through the Salinas valley. Traffic is agriculture support. Being a coastal region, the road temperatures are not very hot - nothing like driving I5. I packed the Prius heavy. Carried more water than last time (5 gallons), more food, more clothing for hot and cold weather, and more gear. I did not bring an easy up as the new big tent has a rain fly that helps shield the sun somewhat. Unpacking is like watching a clown-car. So much stuff in such a small vehicle. Daytime temperatures were in the mid-80s. Overnight lows were cold! I checked before the event and wunderground was saying 45F. In reality, it was 37F on the first night and colder on the next. Rumor says it got to below freezing on a few nights. Camera temperatures were running cold, too, I saw 3C on the EXIF. Will have to do more work to get these ranges into the library of darks. Here's a quick stack of IC 59 for about 5 hours of integration. No histogram work, it's just STF after stacking. Fairly pleased with how this looks already!